The results of the experimental study of shafting torsional vibrations of a T-175/210-12.75 heating turbo unit at Omsk CHPP-5 are presented and discussed. The hardware and software used in the study were previously described. The technique implemented for controlling the torsional vibration parameters was detailed in the first part of this work. The results of the previous calculation study agree well with the experimental data on the torsional vibration control. The features of the discrete phase method used for the determination of the shafting torsional vibration parameters are considered. It was shown that the parameters of forced and natural vibrations should be registered using different approaches to the collection and processing of the measurement results. Errors made when processing the measurement results for forced torsional vibrations are described by citing specific examples. The data processing techniques used by different researchers are compared by citing the available test results. The consequences of incorrect averaging of time intervals between labels of a measuring disk made with the purpose of eliminating the pitch difference effect are shown, and it is demonstrated that the difference relations between intervals cannot be used for the subsequent calculation using the fast Fourier transform. The preliminary results in the determination of the shafting torsional vibration parameters in one measuring cross section are presented. It is shown that the shafting torsional vibration intensity depends on the operation modes of a turbo unit and is highly dependent on the change in the steam consumption in the low-pressure section (LPS). 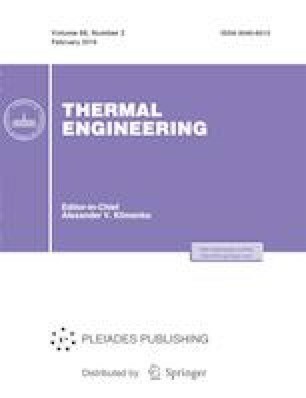 These research results are the first to prove that there is a dependence of shafting torsional vibrations of a T-175/210-12.75 heating turbine on the relative volume steam consumption in the LPS. The problems to be solved for further improvement of shafting torsional vibration control systems of turbo units are formulated.